Jump City’s Multicolored Air Castles for Lords And Ladies, Princes and Princesses, Knights and Duchesses, Kings and Queens – a colorful Castle for everyone! Strong colors brighten your children’s bounce house party. Kids will have a grand time ruling and making friends in the Castles with 360-degrees of brilliant and joyful regal fun for all young royalty! 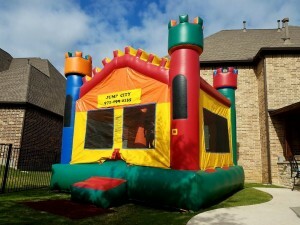 This majestic bounce house is fit for any king or queen, or royalty of any kind. Colors include; blue, green, red, yellow and orange, along with four tall spires to make any palatial party a success. Jump City promotes healthy activity and safe jumping disguised as entertainment. It is so much fun to see their delight when guests see a bright happy classic castle. Call today to book your TX bounce house rental for a child you love! This bounce house will keep your children entertained for hours on end! This jump house is one product in a fantastic line of bright airy bounce castles delivered to Plano, Dallas, Frisco and a stadium full of other Texas Cities, like YOURS.